More than 40 human trafficking cases have been reported in the first two months of this year, with the majority of victims sent to China for forced marriage, according to the Myanmar Anti-Human Trafficking Police Force, state media reported. 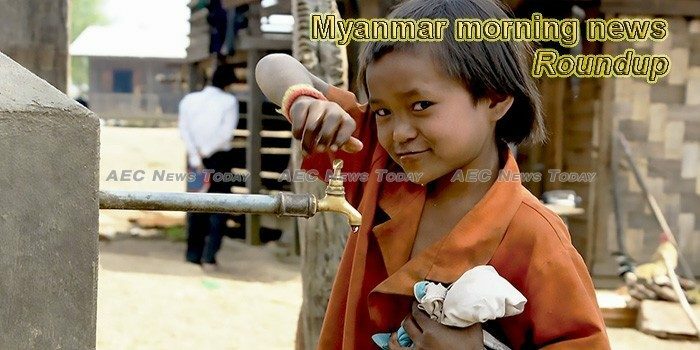 Myanmar is striving to attract investment in the western Chin state, stressing that private investment can help resolve the challenges of poverty and inequality and create a better social environment there. Sembcorp Industries has officially opened a US$310 million (S$420 million) power plant in Myanmar. Volker Turk, UNHCR assistant high commissioner for protection, has laid emphasis on safe and dignified return of Rohingya people to their place of origin in Myanmar with full restoration of their rights. The power ministry will produce an additional 3,000 megawatts of electricity in the next three years, said Union Minister for Electricity and Energy Win Khaing, on March 6. Myanmar authorities seized narcotic drugs valued at 2.56 billion kyats ($1.69 million) in Mandalay region, the Central Committee for Drug Abuse said on Monday. State Counsellor Daw Aung San Suu Kyi has vowed to ensure that there will be no discrimination in the issuing of national IDs to Hindus and Muslims. The price of bananas recently showed an overall increase in banana production areas in southwest China. The sudden and rapid increase was at its strongest in the first week of March but weakened in the second week. In some production areas the price stopped rising, but the average banana price still steadily climbs. Stakeholders from the public and private sector gathered last Friday to discuss the National Export Strategy (NES) 2020-2025, including actions to take to boost Myanmar’s export sector. Despite some progress, the Myanmar peace process may take longer than expected, US Ambassador to Myanmar Scot Marciel said. The teaching of ethnic languages in schools and development of local curricula could deliver both educational and political benefits, and represent critical steps towards decentralisation. Efforts at destroying of illegal smuggling routes in Bago Yoma Ranges and Rakhine Yoma have taken more than expected. and it is hoped that these illegal routes will be destroyed during March according to Pyae District Forest Department. Under the updated National Export Strategy 2020-2025, Myanmar is targeting total trade volumes of US$31 billion for the current fiscal year, with US$15.3 billion for exports and US$15.8 billion for imports. If successful, this would reduce the trade deficit to US$500 million. More than 16,000 Rohingyas have arrived in Bangladesh since January 2018. For most of his life Ko Tun Win Zaw had been dependent on his eldest sister for his survival as he was afflicted with polio since the age of one. A couple were jailed on Monday (18 March) for abusing a maid from Myanmar, more than two years after they were convicted for committing similar offences against an Indonesian maid. Farmers were paid on Wednesday for land seized by the Prisons Department when Mandalay Central Prison was built in Aung Myay Tharzan township, U Zaw Myint Maung, chief minister of Mandalay Region, said. Fighting between Myanmar’s military and ethnic Rakhine insurgents has now reached the ancient temples of Mrauk U, the former capital of the Rakhine kingdom and a popular tourist site, local residents said on Monday (Mar 18). Local police force declared that Myanmar authorities have confiscated 22.9 kilograms of suspected uncut amber stones in Mokaung township, Kachin state. The Arakan Army (AA) will attend the peace talk between the government and Ethnic Armed Organizations (EAOs) which have not signed the Nationwide Ceasefire Agreement (NCA), to be held in Nay Pyi Taw on March 21, said Khaing Thu Kha, the spokesperson of the Arakan Army (AA). Amid increased pressure from China to resume construction of the controversial Myitsone hydropower dam in the far north of Myanmar, State Counselor Aung San Suu Kyi has said the public should think about the project “from a wider perspective,” Myanmar website The Irrawaddy reported on March 14. Myanmar’s stock exchange could hardly be in a better location. The imposing stone building commands a corner on one of downtown Yangon’s busiest intersections and was originally the central Reserve Bank of India’s branch when Burma was a dominion of the British Raj. Frontier Services Group (FSG), founded by former US military contractor Erik Prince, says it is moving into Myanmar to provide security services to Chinese and other foreign investors. French contractor Vallourec has won a contract from PTTEP to supply oil country tubular goods (OCTG) for the Thai national upstream company’s upcoming M-9 West exploration well off Myanmar. Vallourec will supply more than 5000 tons. This week’s Myanmar morning news feature photo acknowledges World Water Day, March 22.